UPDATE: The cats at the Cat Adoption Shelter were moved to our new shelter in Monticello upon completion of its construction in October 2016. We continue to provide care for cats awaiting adoption at the Monticello location, and the Olin Cat Adoption Center has closed. 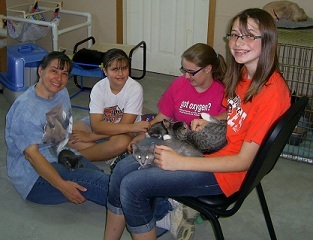 The new Cat Adoption Center, located at 301 Jackson Street in Olin, houses 12 cats who are neutered or spayed (as age appropriate), vaccinated (as required by the State of Iowa) and ready to be adopted. Best of all, the available cats are free roaming in the facility not caged like other facilities. Deb Stockman and daughters Meghan, Kaitlin and Nicki of Springville. Deb and family have bottle fed many babies whose lives were endangered when they lost their mothers. Thanks to the many volunteers who perform daily duties of feeding, watering and scooping litter boxes along with other cleaning needed. Other volunteers help out during our open hours on the weekend. The many, many hands involved certainly make light work of this big project. If you are interested in helping out at the Cat Adoption Center, please go to our signup sheet. New volunteers are contacted and a training session is scheduled. The more hands, the better! Adoption hours are Saturday and Sunday from Noon to 4:00 pm or by special appointment.